I'm overdue for a post about my wedding shower, but I'm on track on sending thank you notes to everyone who attended! And in anticipation of my second shower in August I've ordered more thank-yous featuring our engagement photos from Minted. I love how our Picture Perfect Thank You Cards turned out, and can't wait to order more thank you notes as we unwrap more gifts leading up to our wedding! P.S. If you love all things paper pretty, you'll want to come back Monday for a special giveaway with Minted! Love them! You two are such a beautiful couple! Love these! Great job staying on top of the Thank Yous! 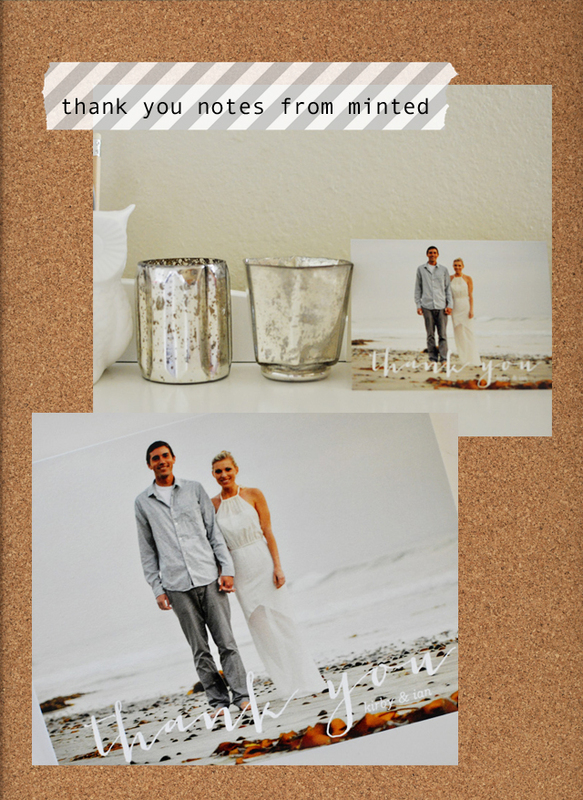 I love Minted and I love your engagement pics! love these! you both look great! such cute thank you notes - such a great idea. I've been needing to order thank you notes.... maybe after we take engagement photos I'll follow your lead and try this! cant wait to see photos from the shower! I love love love these thank you cards! I absolutely love the cards! These are lovely. I love thank you notes- so nice to send and receive.